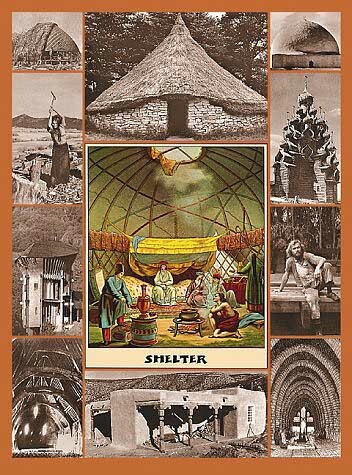 With over 1000 photographs, Shelter is a classic celebrating the imagination, resourcefulness, and exuberance of human habitat. First published in 1973, it is not only a record of the countercultural builders of the  60s, but also of buildings all over the world. 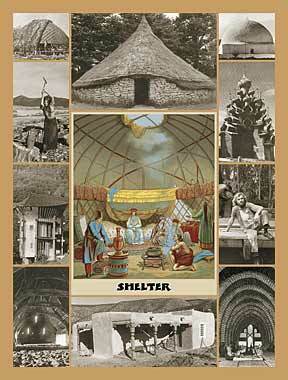 There is a history of shelter and the evolution of building types. Tents, yurts, timber buildings, barns, small homes, domes, etc. There is a section on building materials, including heavy timber construction and stud framing, as well as stone, straw bale construction, adobe, plaster and bamboo. There are interviews with builders and tips on recycled materials and wrecking. The spirit of the  60s counterculture is evident throughout the book, and the emphasis is on creating your own shelter (or space) with your own hands. A joyful, inspiring book.